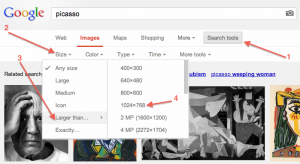 While soaMDID and ARTstor are usually your best source of images at the UW for teaching and presentations, there are times when a Google Images search is necessary. Since the size of images found in a Google search can vary widely, it is important to use the tools Google provides to narrow your search. The image below is a screenshot of the upper menu bar you see after doing a Google Images search; you can click on the image to get a bigger view. The numbered arrows show the order in which you click menus to narrow the search. To get the best images for presentations, you want to have images that are 1024 x 768 or larger. Anything smaller than that will likely appear pixelated if you try to fill a PowerPoint slide with the image. However, keep in mind that much larger images will tend to slow down your PowerPoint slideshow.